OOPS wrong adage, but the try, try again really fits. I like to succeed, but I also LOVE to experiment. My dear friend Jenn and hubby both gave yesterday's Bleu cheese spread for the Danish Cube Steaks two thumbs up, but I couldn't stop there - I still had spread left! I also had a fresh pork loin and had just read Martha's STUFFED FLANK STEAK recipe and voile' just like Melanie Griffith, er Tess McGill in Working Girl combining Trask and radio to succeed, I had an idea! I combined pork roast, our new favorite Bleu cheese spread and Martha's flank steak style with superb results - true success! In a small food processor blend together the mayonnaise, bleu cheese crumbles and green onions until smooth. Cut volcano shaped slice out of the center of each pork half. Next time I will buy a large roast and have it butterflied, but today I worked with what I had. 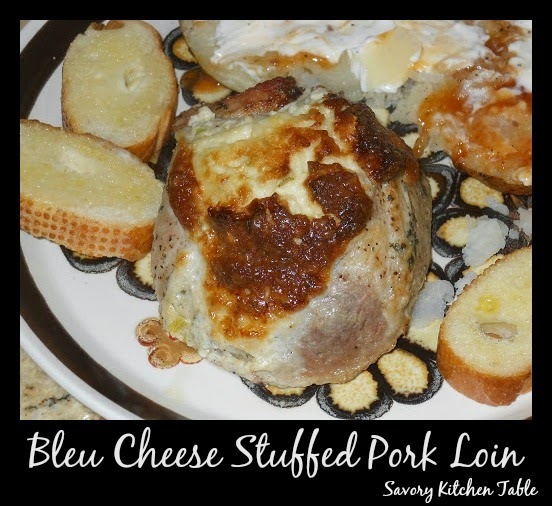 Fill with bleu cheese mixture. Bake at 350 degrees for 1 hour- 1 1/4 hours. Now nothing goes to waste at our house. We use it until it can be used NO more. If it's a sauce, it may become a dressing for hubby's salads by adding flavored vinegars or oils or a filling for a casserole, but it gets used. I had a tiny bit of our favorite BBQ sauce left, but it wasn't enough to do much with, so I used it as a rub on the baked potatoes and then mixed the last couple of tablespoons with some butter and sour cream and darned if it wasn't super yummy and flavorful too!